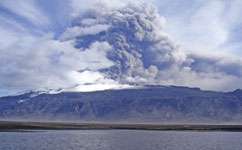 (Phys.org) —The Icelandic volcano's ash plume that caused huge air travel disruption across Europe in 2010 resulted in the oceans absorbing more carbon dioxide (CO2) than usual, say scientists. 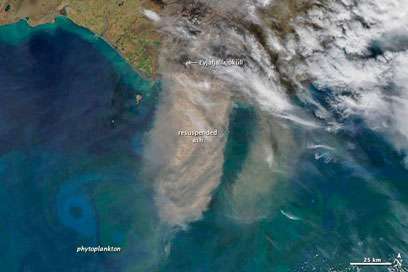 They found that particles from the ash cloud that fell into the ocean provided microscope plants, called phytoplankton, with a nutrient boost in the form of iron. Phytoplankton are important as they absorb CO2 from the atmosphere. In fact, while phytoplankton represent just two per cent of all plant matter on Earth, they account for half of all CO2 absorption from the atmosphere. 'This had never been done, no one has ever made any at-sea in-situ measurements during an eruption,' explains Professor Eric Achterberg, from the National Oceanography Centre Southampton, lead researcher on the study. The ash is blowing over the North Atlantic Ocean. The ocean itself is coloured with swirls of blue and green, revealing the presence of a large phytoplankton bloom. In the oceans south of Iceland there isn't usually enough iron for phytoplankton to bloom for more than a few weeks before it runs out. This latest study reveals that the volcanic ash column supplied enough iron that the phytoplankton were able to bloom for longer, and absorb more CO2 than they would typically have been able to. 'In normal years the iron levels are very low in the Iceland basin as the system runs out of this nutrient during the annual spring bloom. But in 2010 the iron supply was so high that demands were met. But then the phytoplankton stripped the nitrogen out of the surface waters so they became limited by that instead,' says Achterberg. The research, published in Geophysical Research Letters, found even with the added iron from the volcano and the longer blooming period, the phytoplankton were only able to absorb about 15-20 per cent more CO2 than in other years before the nitrogen in the water ran out. Intentionally adding iron to the oceans, called iron fertilisation, has been suggested as a way of getting phytoplankton to bloom and absorb more carbon dioxide, to combat rising levels in the atmosphere. The results in the study were collected on three separate expeditions on the RRS Discovery. Eyjafjallajökull erupted just as the first cruise was about to embark and nearly spelled the end of several long-planned experiments - scientists had originally intended to observe the normal iron levels in the water and see if phytoplankton struggle to find enough iron. But then the researchers became the first to measure the effect of a volcanic eruption on the ocean productivity, whilst the eruption was happening. 'We managed to get right under the plume. We sampled there to look at the effects of ash on the water column and see how it affected dissolved iron and aluminium concentration. It was challenging - the ship was covered with ash,' concludes Achterberg. More information: Achterberg, E. et al. (2013), Natural iron fertilization by the Eyjafjallajökull volcanic eruption, Geophys. Res. Lett., 40, doi:10.1002/grl.50221.